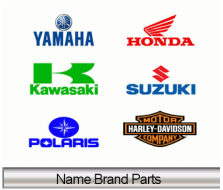 For name brand parts, accessories, apparel, tools, chemicals, etc, click on the 'Name Brand Parts' link to open an online catalog. In the drop down menus, pick a catalog, then pick a section to search. Contact us with the part numbers that you are interested in and we'll give you the best price. If you don't see the part that you are looking for, please email us at sales@dirtcheappowersports.com with a description, good pictures, the make and model of your cycle, and your zip code and we will respond back with availability and price.